Superior in strength and created to look and feel just like your natural teeth, dental implants are a great choice for replacing one or more missing teeth. A surgical treatment, dental implants are small titanium posts placed into the empty bone socket where a tooth was once located. For this part of the treatment, we will suggest one of our specialists who will perform this surgery with great skill and care. Once your gums and bone have fully healed, giving time for the metal posts to fuse directly to your bone tissue for a strong and lasting bond, you will come back to our office to complete the implant. Dr. Marvin Herschfus, our expert dentist, will attach a small connector to the metal post called an abutment. He will then create a custom dental restoration, generally a dental crown, dental bridge, or full or partial denture, to permanently attach to the abutment. 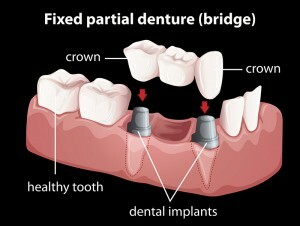 Dental implants do not slip, move, or require much maintenance. Simply care for your new smile as though the dental implants were your natural teeth! We will continually examine your dental implants any time you visit our office to ensure your smile stays bright and healthy. If you would like to learn more about dental implants in Berkley, Michigan, please contact us today!